As usual my tutorial is aimed at people who have no prior knowledge of GIMP. My aim in this tutorial will be to enable someone to follow in my footsteps and achieve the same end result as me. I want complete beginners to be able to follow the tutorial. So there will be little assumed knowledge and I will explain each step. Screen shots will aid the explanations. I have highlighted the relevant areas so that they are easily identified. The illustrations will also help you find where things are in GIMP. GIMP software is freeware. 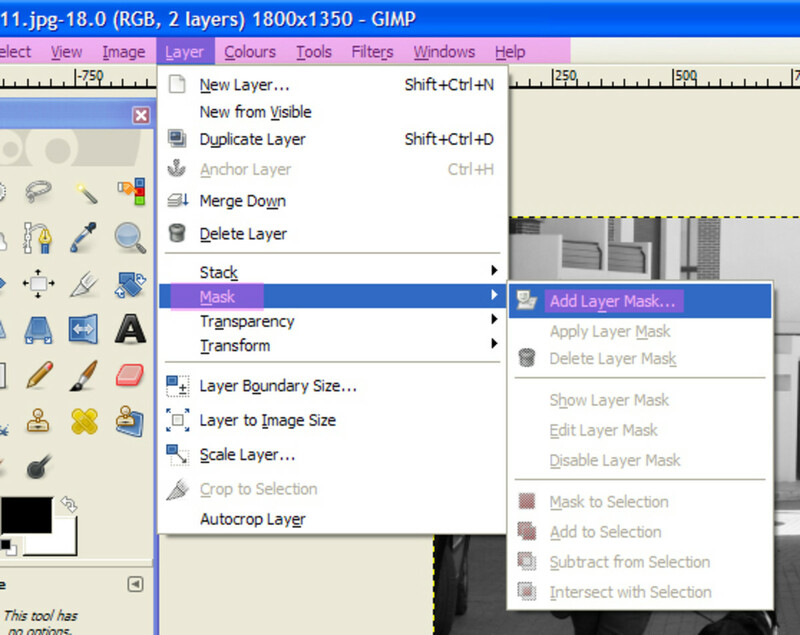 GIMP is a free alternative to PhotoShop. GIMP is powerful enough to do many of the things that PhotoShop can. For some reason the GIMP link will not work as a link but if you copy and paste it into your browser it will take you to the site. This is the photograph I will be using for this tutorial. You are welcome to use this photograph if you want to follow this tutorial. To use this photograph just right click on this photograph. Select the save image as option and place it somewhere on your computer where you can find it. When you open up your GIMP program for the first time you will notice that it is slow to open. But bear with this as it is well worth the wait. 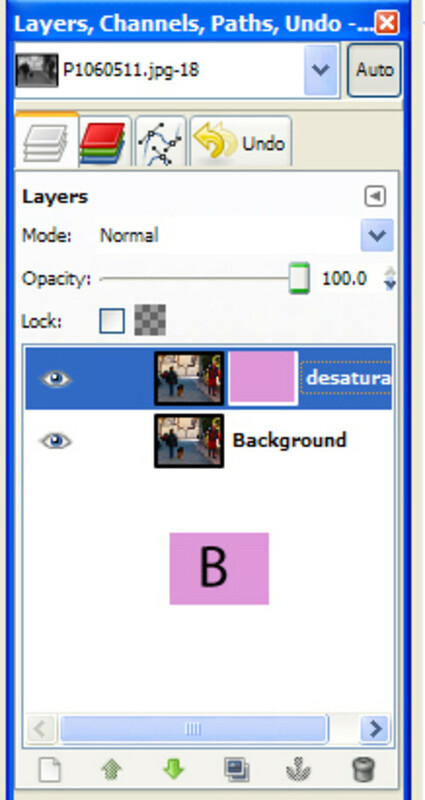 There are three separate windows a workspace, tool bar and the layers palette. You can arrange these windows how you like this is how I have laid mine out see fig one. I like this layout because it is similar to the layout in Jasc PSP and in PhotoShop. This layout helps me because I find things are still where I expect them to be. If you want to see a large picture click on it. I have enabled the 'View original size on click' option on each of the screen shots. To select an image to work on we go to file. You will find file at the top of your GIMP page on the left-hand side. 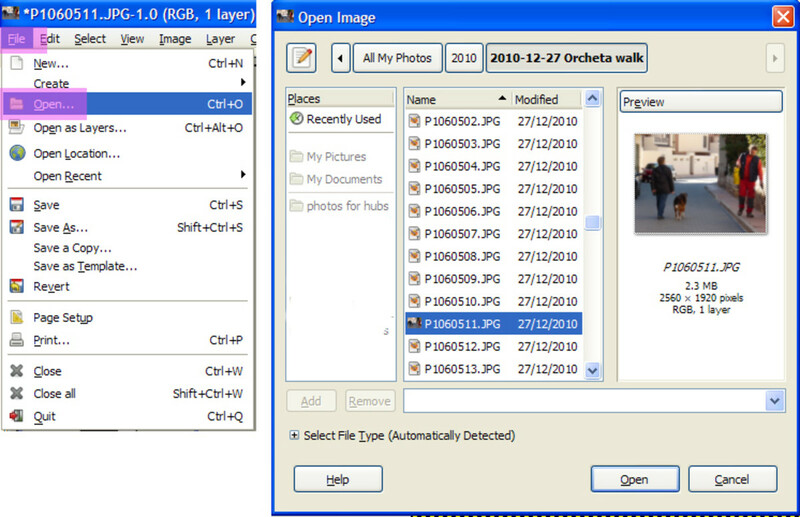 Click on file and you will be presented with a drop down menu, see the left hand side of fig two. Click on open and you will be presented with another window see left hand side of fig two. Go to where you have put your image and click on it. When it is highlighted blue then click on open. This will bring your image into your workspace. Your page should now look something like this see fig three. We need to make a copy of this background layer. We do this by going to the layer palette, which is on the right hand side of your screen. Your screen should now look like fig four. If it does not look like this check that the first icon is selected. The icon looks like a grey stack of paper. If this is not the icon selected then you will see something different. We need to have this first icon selected for our purposes. This icon is the top left hand side and I have highlighted icon on fig four. Click on this icon to select it. 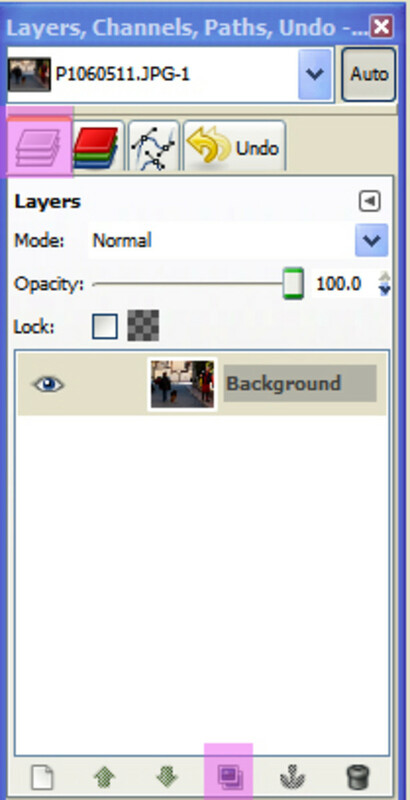 To make a copy of the background layer go to the bottom of the layer palette. Here you will see an icon that looks like two computer screens one on top of the other. Click on this icon and this background layer will be copied. Your layer palette should now show two layers. The top layer is called Background copy. The one underneath is Background these names are given to these layers by GIMP. See fig five. We are only going to use these two layers. So usually I would not bother naming these layers. But so that you will know how to name a layer I will show you how to do this. I will show you how to give the background copy layer a new name. When editing an image that requires many layers open it is good to give those layers names. Try to give the layer a name that reflects what you are doing on the layer. 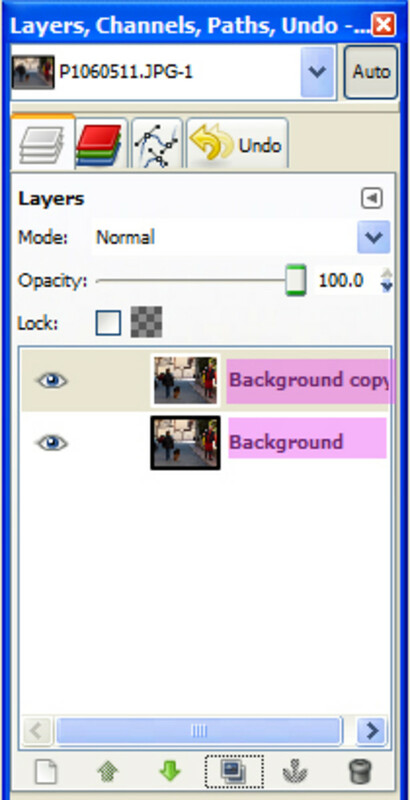 To select the background copy in the layer palette click in the picture. It should turn blue showing that it is selected. To the right of the picture you can see the text background copy with a lightly drawn box around it. Place your cursor somewhere inside the text inside the box and double click on it. Now the text ‘background copy ‘ is highlighted in blue all you need do now is type the name you want to give the layer. In this case I have given this layer the name desaturate because that is what we are going to do next. 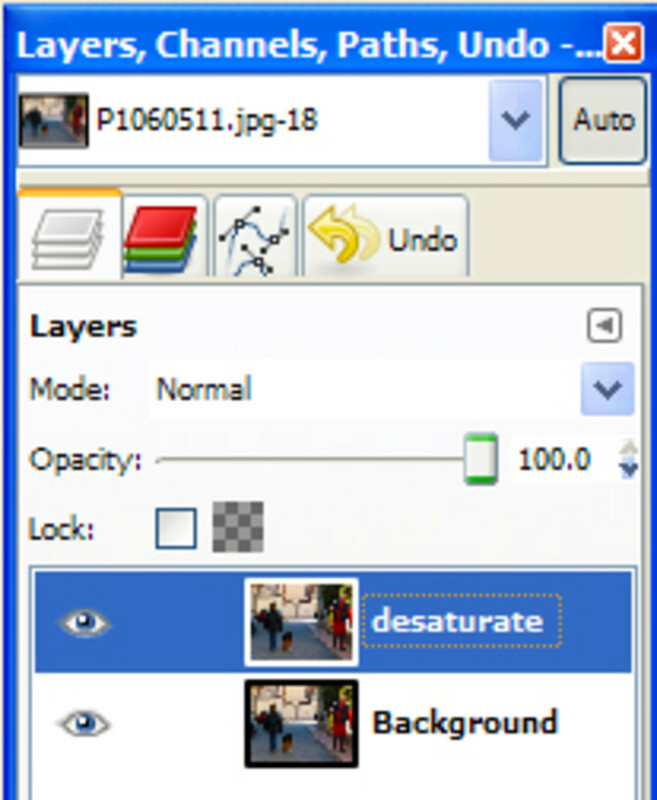 Select the layer named desaturate because this is the layer that we are going to work on. Clicking on Desaturate will open a new window. 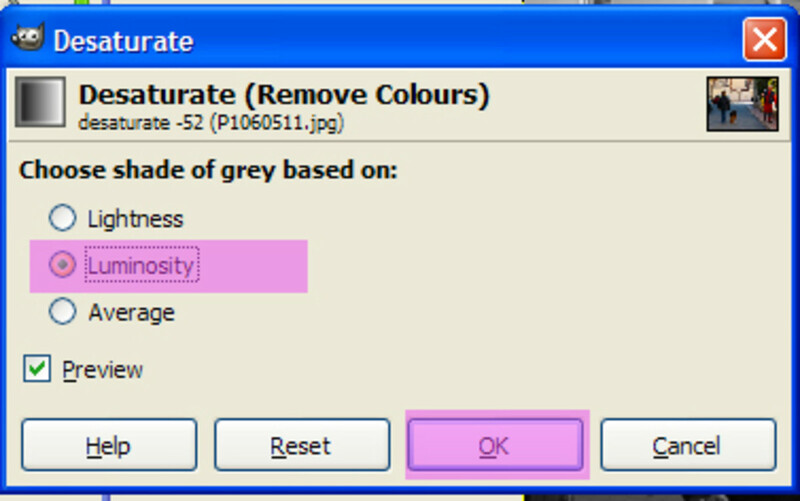 It invites you to choose shade of grey based on... and it gives three options. Lightness, Luminosity and Average see fig eight. I have chosen Luminosity and you can see that a little dot has appeared in the circle next to Luminosity. The dot next to an option shows that the option is selected. Click on each option in turn. As you click on each one you will see the photograph change each time. I chose luminosity because I thought that this effect suited our photograph best. If you like one of the other two options better then choose that one instead. When you have chosen click on OK. This will turn our photo into a black and white image. But it is only changed on this layer, the background layer underneath will remain in colour. We are now going to uncover the colour on the background layer but only of the workman. We could do this by using the eraser tool. But I prefer to do this by using a layer mask. I prefer a layer mask because it allows me to edit in a none destructive way. If I use the eraser tool and I make a mistake it is not as easy to undo that mistake as it is using a mask. The bit that I have mistakenly erased is gone. I can't just paint that bit back. I have to go back to the place where I made the mistake. Only there can I undo the step. Undoing a mistake can be a laborious and time consuming task. Backtracking means that all the work you did after the mistake will also be lost. But this does not happen using a layer mask . On a mask layer we can undo or change what we have done at any point. Go to the tool bar at the top of the screen and click on layer. From the drop down layer,click on mask. Clicking on Add Layer Mask opens another window. 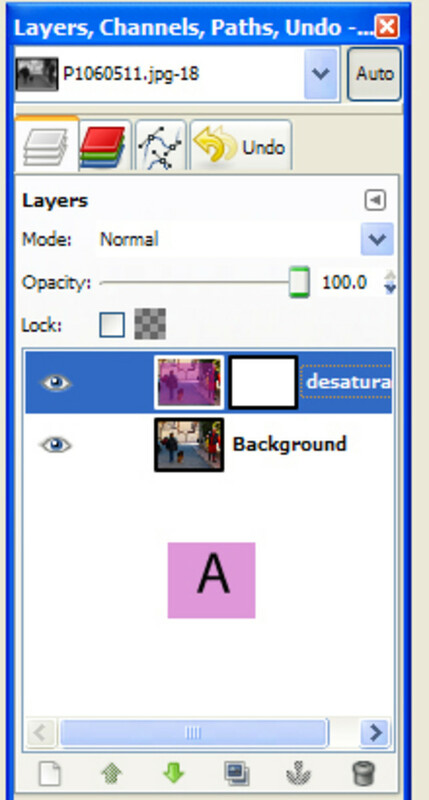 On the top of this window you will see that the layer that you are adding a mask to is identified. We are now going to uncover the colour on the background layer but only of the workman. We could do this by using the eraser tool but I prefer to do this by using a layer mask. I prefer a layer mask because it allows you to edit in a none destructive way. If you use the eraser and you make a mistake you can’t just paint back the bit you have just erased. If you don’t discover your mistake right away you will have to back track until you get to the point where you made the mistake in order to put it right. This also means that all the work you did after the mistake will also be lost but this is not so with a layer mask. Clicking on Add Layer Mask opens another window and on the top of this window you will see that the layer that you are adding a mask to is identified. Congratulations you have now added a layer mask to the layer named desaturate. 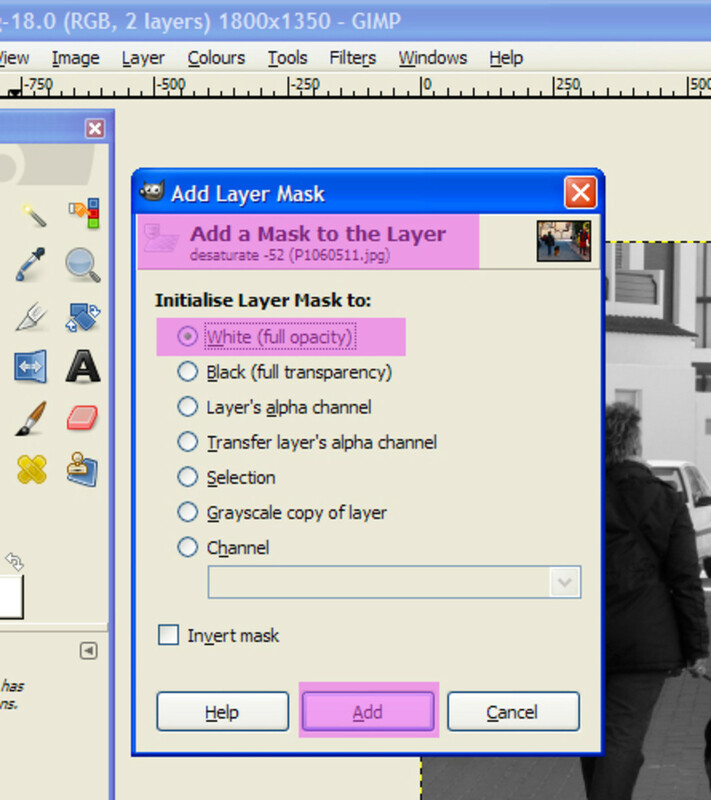 In order to use the layer mask it is important that you select the mask to work on and not the desaturate layer itself. 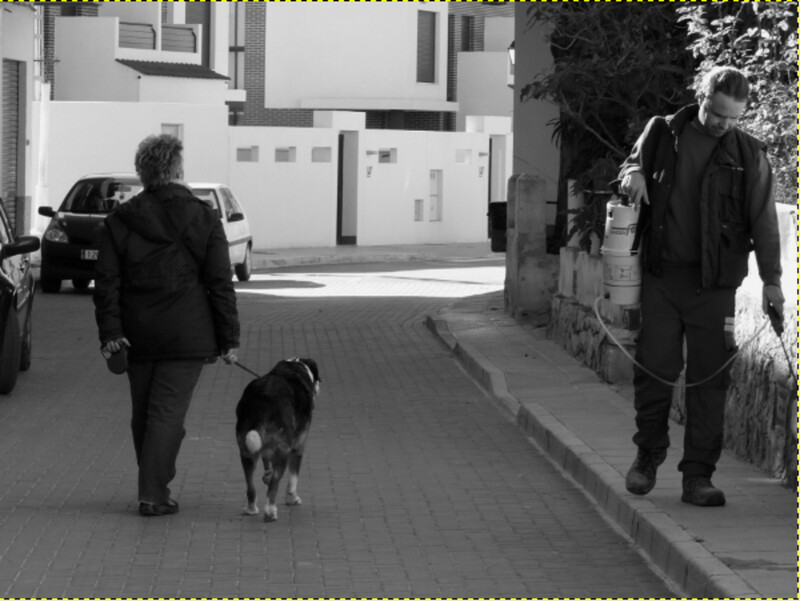 Click on the desaturate layer and click in the photo see A in fig twelve, you will see that there is a white line around the box with the photo in. This white outline tells you that it is the layer itself that is active and not the mask. To the right of the photo icon you now have a white box this white box is our mask. In fig twelve A the white box has a black outline showing that it is not selected. At the moment our mask is white but as we work on the mask you will see this icon change as we paint black onto the mask. Click inside the white box and this will select the mask see fig twelve B the white outline is now around the white box and the photo icon has the black outline. Because the mask icon is white the icon will just appear solid white. Don't worry when you can't see the white outline it is there but it blends in with the mask icon. The mask has now been selected and we are ready to begin uncovering the colour on the layer below. If you are having any difficulty seeing the screen shot images clearly just click on the image and you will be able to see the image full size. We are now ready to begin uncovering the colour. 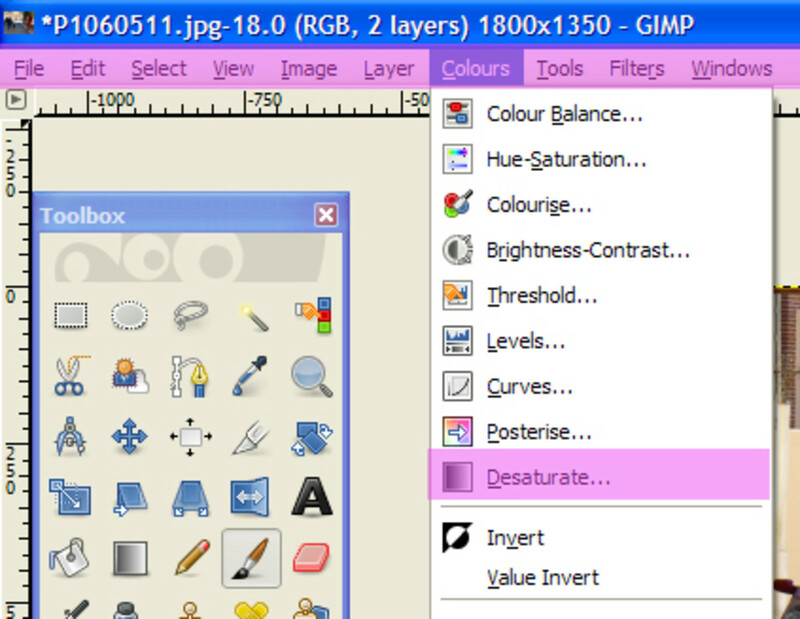 Go to the toolbox on the left hand side of the GIMP screen and select the paint brush tool. The brush tool is located on the fifth row down one icon in from the right hand side it is easy to spot the icon looks like a paintbrush. See fig thirteen the brush icon has been highlighted for you. With the paintbrush tool selected we need to select the colour we are to paint in. The third row below the brush icon is the icon that indicates what colours are active in the foreground and background. In fig thirteen the black oblong is on top of the white which tells us our foreground colour is black and our background colour is white. The foreground colour is the one that your paintbrush will paint with if we want to change the foreground colour to white all we have to do is click on the little two-way arrow and it will switch the two colours. If your two colours are not black and white don’t worry it is easy to change that, just underneath the black oblong you will see a miniature icon in black and white. Click on this miniature icon and the colours you had will be switched to black and white. Make sure the black oblong is on top. The bottom half of the toolbox displays the paintbrush options. I have highlighted my choices. It is important to have the opacity set at 100% because where ever we paint solid black the colour will show through. 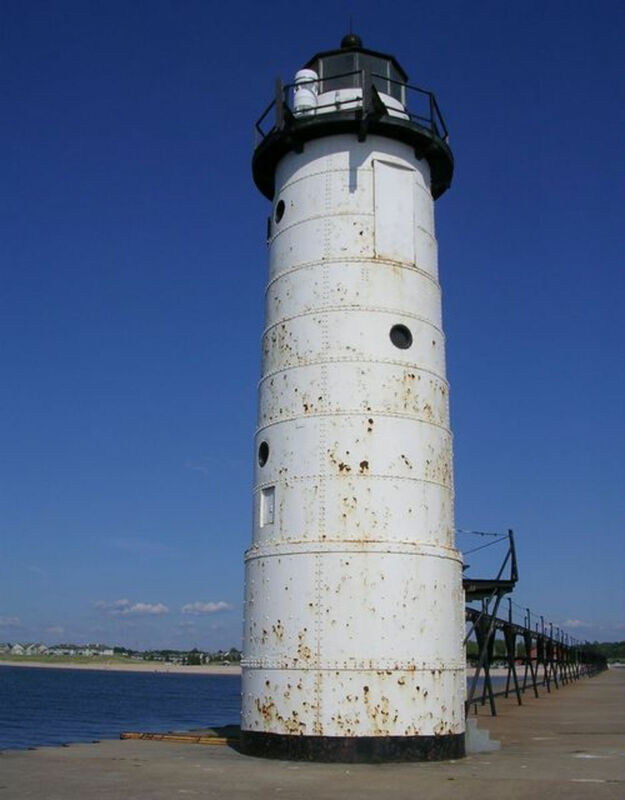 However, if we paint with a lower opacity the colour will be limited by the degree of opacity set. I have chosen a brush size of 4.54 because I am comfortable with this size. If you want to work with a larger or smaller brush just move the slider until you have a brush size that you are comfortable working with. Now the fun part begins. With your paintbrush tool and the colour black selected place your cursor somewhere inside the workman in the photograph. With the left-hand mouse button held down begin to paint. 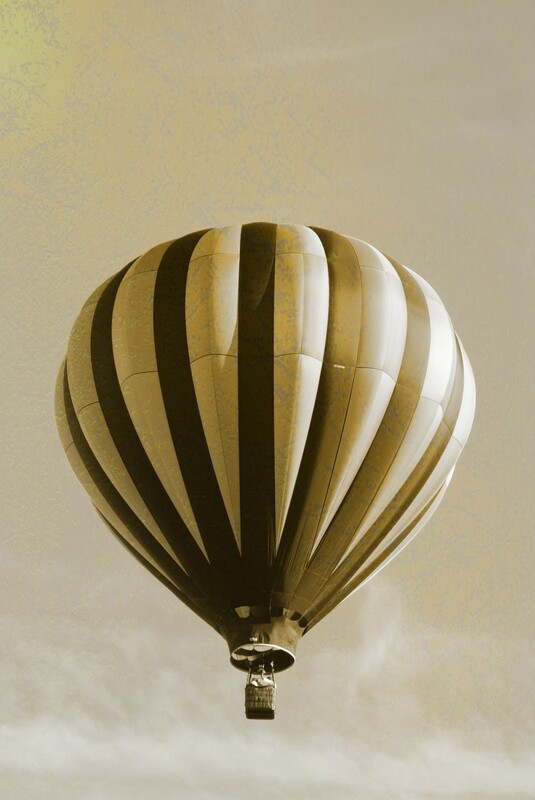 If you start to see the colour black being painted on top of the image it means that you have the layer and not the mask selected. If this is the case just hold down Ctrl, Alt and Z or go to edit on the top tool bar and select the undo paint brush in the drop down menu. Making sure that the mask is now selected start to paint. Where you paint black onto the mask it will take the opacity of the desaturate layer down to zero. What this means is where you paint black on the mask the layer becomes like clear glass and you can see through to the layer underneath. In this case the underneath layer is still in colour so we can see through to the coloured image below. As you paint on the mask so the colour will show through see fig fourteen. Notice that the layer icon on the layer palette is now no longer a solid block of white it now has black where you have painted on the mask. Continue painting until all the coloured area below that you want to show through is visible. I use the zoom tool to zero in on the part of the image I am working on. 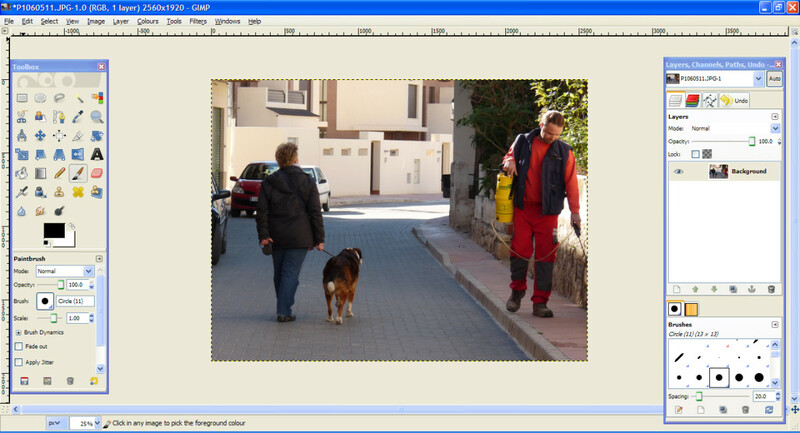 The zoom tool is found in the toolbox on the left-hand side of the GIMP page, see fig fifteen. The zoom icon is a magnifying glass and is located on the second row of icons on the right hand side. Under the toolbox palette is the option box for the tool selected in this case the zoom in option is selected. If you want to change from zoom in to zoom out just hit the Ctrl key as this toggles between the two. If you find that you have uncovered a bit of colour that you did not mean to don’t worry. Using a layer mask this is the easiest thing in the world to fix. 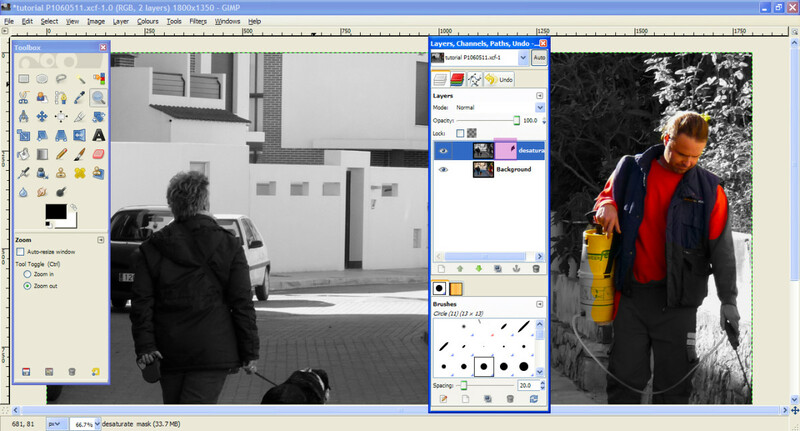 With your paintbrush tool selected we need to change the foreground colour from black to white. Go to the double ended arrows that you can see highlighted on fig fifteen and click on them. This will change the foreground to white and the background to black. Now when you paint over the mask in the area that you have unwanted colour it restorers the layer's opacity to 100% to the area that you have painted with the white. This means where you have painted in white you will see the black and white image on the desaturate layer and will no longer be able to see through at that point to the layer below. How easy and neat is that? You can repeat this process as many times as you like, until you are completely satisfied with the results. Remember the more time and care you take the better the results. Below is the finished photograph and I think that the selective colouring of just a small area has made this image pop! I hope that you have enjoyed this tutorial and that you have found it easy to follow. Any questions or anything that you have a problem with just drop me a line and I will try to get back to you right away. No, I mean it maggs224. I will be around to top up my GIMP skills. Thanks again. Very informative, nice article maggs224. I'm really excited about this hub Maggs. Your information is clear and so useful for those of us that like editing our work. I always use picasaweb from google but I love trying out new ones and comparing them. I voted up and hit all buttons but funny. Thanks for a really helpful hub. Hi Cindi thank you so much for your kind comments and for the link I have inserted two links to your hub, one in the last paragraph, and one link on the word colour in the body of the text. Thank you very much for this article. I really enjoyed it! Cool explanation - I am going to link to a hub I'm publishing on selective coloring - but with a different approach. Love your photos and explanations! Thank you Shelia for your comments, I hope you have fun selectively colouring some of your photographs. If there is ever something that you would like to know how to do either in Photoshop or GIMP drop me a line and if I can I will show you how to do it. What a great tutorial! Thanks Maggie! Bookmarked. Hi MMM, GIMP is similar in many ways if you can use one you can use the other as it is easy to recognise the icons and features used by GIMP. 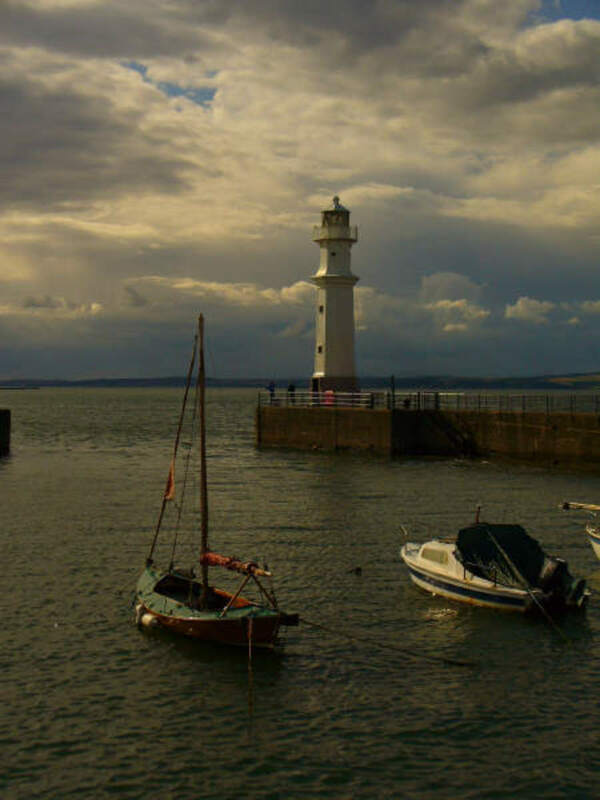 Considering that GIMP is free to use software it is a very powerful piece of kit. It seems to take no longer than PhotoShop to do most things. Of course the latest version of PhotoShop can do things that GIMP can not do but it is not long before someone changes that GIMP continues to improve. For most people GIMP is more than man enough to tackle everything they need when it comes to photo editing and manipulation. i dint realize GIMP was so much like Photoshop, interesting. I may have to check this out as an alternative. Any comparisons as to speed and features? I know exactly what you mean studio headphones, I have the same problem when people assume that you know stuff that you don't it just leaves you hanging there unable to follow. Thank you soo much for providing images with your walkthrough. You don't know how annoying it is to read something and not be able to actually see what is being done. Fab tutorial in every way. I'm itching to start working more with photos, wanting to learn many programs, etc. Thanks. Wowm Maggs, a great hub on Gimp. I love using Gimp, as it is a miracle worker for making great art for hub pages and for altering photos. And it is free too! Rating this up! 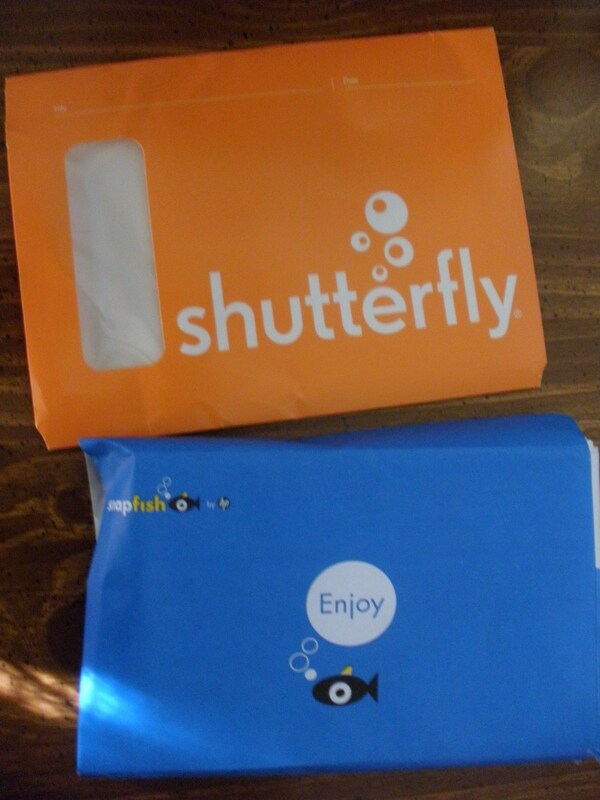 Hi TajSingh, I hope you have fun trying this out I know it gives me lot of fun playing with this software. :) Thanks for th positive feedback it is a great encouragement to me. Hi MrsJ.B. I am glad that you enjoyed the tutorial, and thank you for the positive feedback I appreciate it. Hi maggs. Excellent tutorial. I'm gonna try this one out. WOW this is amazing. I have added it to my favorites. I want to show it to my kids to see if they want it on their computers. This is great, very detailed and something interesting to learn. Thank you. Downloaded GIMP and Just finished using it for the first time. Thanks! Hi samsons1, I am so glad that you enjoyed the tutorial. I really appreciate the positive feedback and the vote up, they are a great encouragement to me.